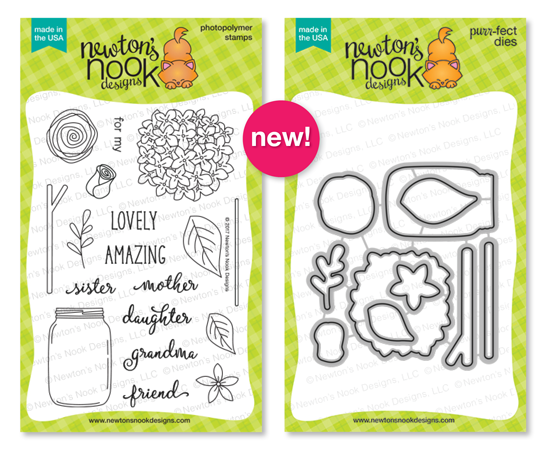 Welcome to day 2 of the April Newton's Nook release! Today I'm showing you this GORGEOUS floral/mason jar set, "Lovely Blooms". I so love floral stamps and then to pair with a jar, various flowers and greenery..this set is absolutely perfect! I'm certain this will be a go to set for me whenever I need a floral card. I started with a kraft A2 sized panel and stamped with a background stamp by Hero Arts Zig Zag Bold Prints, then white heat embossed it. I cut out the white oval, Stitched Fancy Scalloped Ovals by Kat Scrappiness. All of the flowers, jar and greenery were Copic colored and assembled on my oval. I popped some of the flowers up to give the bouquet dimension. I finished off with some Lawn Fawn hemp cord and enamel dots. I plan to give this card to my own special mom on Mother's Day. Visit Newton's Nook Designs Online Store Here! 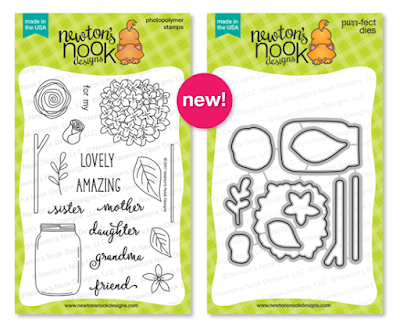 Would you like to win the “Lovely Blooms” Stamp Set? This is so gorgeous - I love the colors and that background is perfect to showcase these beautiful flowers! Ohhhh!!! Lovely bouquet!!! Totally awesome!!! Lovely hydrangea! Love the colors you chose! I LOVE these pretty shades of purple and lilac in this! Beautiful! Gorgeous card! The colors are so lovely! This new set is simply awesome and I can't wait to own it. Your card is gorgeous! Using craft cardstock was a great touch to really bring the focal point to the flowers. Lovely card! Love how you stamped the background. the purple flowers are so pretty. This is so beautiful! I'm in LOVE with the color palette that you used on this! So perfect for spring and it really pops against the kraft background! Thanks for the beautiful project! Wow!! So gorgeous!! Your mom is going to love it!! Oh so pretty, I love the purple shade you used here! Love the pretty colors and that delightful jar of blooms! What a gorgeous card! Love love love this set! Very pretty colors and I like the scalloped oval. The flowers are beautiful and I love that you embossed the background. This looks so beautiful!!! Love this amazing card and your color choice! Fantastic card! I especially like how you colored the glass jar. Love the pastel purples and aquas! I love it, it's so pretty! Great card. Love the colors. Thanks for the inspiration!